Proper club selection on a chip shot shouldn't be that complicated, but for a lot of golfers, they lose a lot of really easy strokes around the green because they don't pick the right club. They're really not sure what they should use and how come they should use that club over another. Let me make it really simple today so you never have to struggle with this again. I have three clubs with me. I have an eight-iron, a pitching wedge and a sand wedge, a 56-degree wedge here. Around the green here, now you can use seven-irons and so on and so forth, but these days, the irons are so jacked up on their loss that a five-iron's like a two-iron I used to play with back in high-school, so eight-iron, pitching wedge and some sort of wedge, like a 56 or a 60 is really good for most of these shots around the green. But what I want you to think about when you're choosing between one of these three or maybe four clubs that you're gonna chip with most often is developing a routine to figure out carry versus roll, because that's really all it is. It comes down to one simple thing, how far do you want the ball to carry, and how far do you want it to roll once it lands on the green. Now the only way that you're gonna figure this out is through some really simple practice, and the way that I want you to do this is to pick a club, let's say we're gonna start with the lowest-lofted one here, in this case, the eight-iron. And what I'm gonna do is make what I would consider a standard chipping stroke. Now standards, no such thing as a standard shot around the green, right, but what I want you to do is develop one so that you have a reference for how hard you hit a normal shot. So for instance, for me, the shot that's really comfortable, 'bout like that. So I took the club about parallel to the ground, give or take, and then I came through on the other side. Now for that basic pitch shot, if I do that, that ball is gonna carry about 15 yards and then roll the rest of the way, about equal distance depending on how fast the green is, of course. Now when I take my pitching wedge, in this case, and I make my same standard chipping stroke, back and through, now that one carried about three yards shorter than the one before and now when I go to the 56, I'm gonna make my, again, my standard chipping shot. And that one carried about three yards shorter than that. So I know that on my standard shot, each shot's gonna carry about three yards less with these clubs. That gives me a great reference point, so now all I gotta do is walk it off and see how far my eight-iron carried, and I eyeballed it there, it's about three yards shorter in each one. And now I have a baseline, and that's really what you're looking for around the green so that when you approach a shot and you've got to carry it ten yards, but you need it to roll 20, obviously the sand wedge is not really gonna be the ideal shot there. So I know with the eight-iron, if I hit it and it's gonna carry 15 yards, or ten, 12 yards, whatever it may have been, and then I know it's gonna roll about the same distance on the other side, I know I've got 30 yards of turf that I can cover with that club. Now with the pitching wedge, it's gonna carry, let's say, 20 percent less, let's say it carried ten yards, and it's only gonna roll about eight, so I know that's gonna be eighteen, and the same thing with this, this is only gonna carry about seven, eight yards, and then it's only gonna roll a few yards, what you want do is spend enough time around the green so that when you're practicing on your standard chip shot, that you know that you can make a little adjustment and maybe take a little bit off, so that's my stand one. Now I'm gonna take a little bit off of it. And I took about a yard and a half, two yards a carry out. So now from my standard baseline shot, I can make adjustments for the typical shots that I'm gonna hit because every shot around the green is always gonna be different, but once I've developed, through practice, a simple baseline, club selection will be a piece of cake. JOIN OUR 352,793 MEMBERS AND GET INSTANT FREE ACCESS TO DOZENS OF VIDEOS! 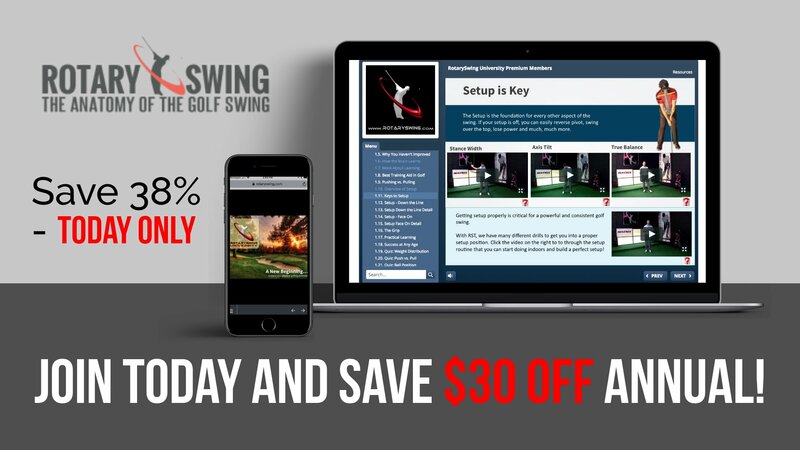 Get Your Free Membership to Finish Watching "How to Chip - Club Selection" Right Now! Join our 352,793 members to watch this video and 200+ more!